I got the inspiration for this salad from Lidia Bastianich. In a recent cooking show she came up with a refreshing celery-mozzarella combo to which toasted walnuts were added for crunch. Lidia mentioned something I fully agree with: celery is a very under-utilized veggie. I know many people don’t like it because of its fibrous and harsh texture. However, if you use the best celery you can find (no need to search for the gigantic creature of my recent past) at the perfect stage of ripeness, and slice it thinly, chances are most of your objections to this stalky creature will go away. Some chefs recommend peeling it, but I don’t see that happening in our kitchen. I find celery refreshing, bright, and use it all the time. For this salad, I adapted Lidia’s basic idea to make a departure on the classic Caprese, a favorite with us. Make a simple dressing mixing olive oil, lemon juice, mustard. Season with salt and pepper. Amounts are pretty flexible, I add a lot of lemon juice probably 50/50 with the oil. Make enough to coat all the pieces of celery and have some extra so you can drizzle all over the assembled salad. In a small bowl, mix the celery pieces with the dressing and allow it to sit for 5 to 10 minutes. Add the tomatoes and mozzarella to a serving platter, place the celery and dressing all over. Scatter toasted walnuts, sprinkle salt to taste (Maldon flakes are a great option here). ONE YEAR AGO: Oh, my God! I think I saw something! This is a perfect summer salad but I could eat it anytime if the tomatoes were good. Maureen, don’t tell anyone, but I intensely dislike cooking shows in which the host/hostess brings kids to cook with. I quickly change the channel. But of course if it was Greenlee, I would watch the whole darn thing and melt away 😉 Double standard? Who, moi? I’ve tried many a time, but I really just don’t like celery. I have to admit this is a fun new take on caprese, though! That looks good! There is something on menu of The Mellow Mushroom in Lafayette, La. Without the walnuts though. It would indeed. It’s a pretty unique place! Only been in New Orleans, never Lafayette, but a technician from Lafayette used to come to our lab to repair a particular equipment and he was from Lafayette – used to tell so many stories about the city, he loved it! It’s a pretty city. Lots of things to do there. My nephew use to attend LSU, but spent a lot of time in Lafayette! I never would have thought to add walnuts to this salad! What a wonderful tasty idea! It makes the salad quite a bit more substantial, so I normally don’t need any other side dish when we make it. This looks so tasty. The walnuts must add a delicious crunch. Yes, and if you have a chance, try it with hazelnuts.. very lovely too! 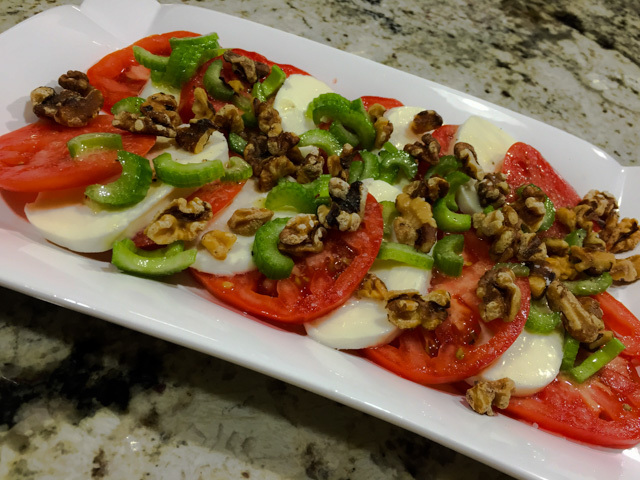 I just posted a recipe for Caprese Salad. I guess great minds think alike! I love celery but I never thought about it with a caprese salad. I’m sure the extra crunch is fabulous. Your tomatoes look so luscious and ripe. This is easily my favorite summer salad. I’ve never tried it with celery. We drink a lot of homemade juices, so I always have celery on hand. In fact, I have everything to make this salad on hand. Guess what we’ll be eating this week! YEAH!!!!! Doing the happy dance! Thank you so much, Kalyn! Always a pleasure to take part of your Round-up!